We have already looked at a different Superbet game from NextGen Gaming, so when this slot came up for review, we already had a good idea of what the game would entail. This other version is called Double Play Superbet and unlike other games which had only one feature you could manipulate on each spin (the Superbet), this game offers you two. When I have reviewed these Superbet type of games in the past, I have always felt that while the feature itself is a good one (and we’ll learn more about the features in this slot in the section below), they have always come at too high-a-price in order for players to fully enjoy them. Does this new Superbet game still follow that same pattern, or is this a game where the player still gets good value when one or more of the features is activated? Let’s take a closer look at the slot and find out. The first thing you notice about the Double Play Superbet slot is that it has the same high quality presentation that were a feature of the other games in the series. The graphics are simple but eye catching and of a futuristic design. The backdrop is gently animated almost so that it is imperceptible and the symbols on the reels are neatly done and animate nicely when triggered on a win. The music when you win is louder and more dynamic than the gentle background music in the base game and in truth it does grate a little on the nerves after a time. The main features of the slot that you can control are all situated to the right of the reels and these are the Doubleplay button, which can increase the size of your multiplier and the Superbet button which we will explore more about in the key features section below. Like on other Superbet games, activating these features on your spin increases your chances of a bigger value win, but at an increased cost per spin. The good news is that you can use both the features on this slot independently of the other, so you can use just one feature and pay a smaller bet per spin, rather than being forced to use both features if activated. The slot features five reels, each with three symbols on and there are a total of 25 lines in play on each spin. That gives you a minimum bet of £0.25 (with a £0.01 coin selection) but you can increase the value of your bet by increasing the coin size and activating one or both of the Superbet and Doubleplay features up to a maximum bet on the slot of £600, which makes this a slot ideal for players of all bankroll sizes. At the lowest coin size, the minimum bet is £0.25 with no features activated, but with the Superbet and Doubleplay features activated to the maximum amount, this increases the size of your minimum bet to a rather large £3.00 per spin. That’s twelve times more than your standard bet, so the question has to be, do these additional features make that outlay worthwhile? 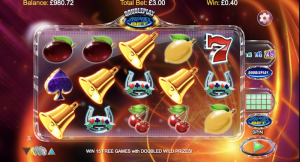 The first main feature of the slot is the symbols on the reels and these range from the lower value fruit symbols (offering between 5 coins and 75 coins as a payout), through to the middle range wins which are landed with the spade symbol, the horseshoe symbols, the silver star and the bell symbol. Wins with these symbols range from 10 coins up to 150 coins. The higher value symbols in the game are the Lucky 7 symbol which offers wins for just 2 symbols on a payline of 2 coins. You can also win up to 250 coins for landing three, four or five of these symbols on a winning line. The diamond is the highest value standard symbol offering wins of between three coins and 500 coins. As you can see, these wins don’t add up to huge amounts when played at lower levels, and so that does impact how much value you get from the slot, especially when you have the two main features enabled on a spin. It is possible to spin for £3 and win back just £0.02 on a spin. The first of the key features on the slot is the Wild symbol which can substitute for all symbols apart from the Double Play Superbet Scatter symbol. This increases your chances of a win as the Wild is stacked on all the reels and also comes with a multiplier. You can also win a cash amount of up to 500 coins for landing between two and five Wilds across the reels on a single line. The other symbol on the reels is the Scatter symbol, which is the Doubleplay Superbet Logo and this offers you a cash prize when you land two or more across the reels of between 25 coins and 2,500 coins. In addition, if you land three or more of these symbols you trigger the Free Spins bonus. For Free Spins you change to a slightly different set of reels and receive 15 free spins. Your wins are tallied in the bonus round and once your free spins are completed the round ends and your cash prize is awarded. You can retrigger free spins from within the bonus round too and unlike some slots, this is not too difficult to achieve. The best aspect about Free Spins is that all the Wild multiplier values you played with in the base game are doubled, so if you are playing the maximum 9x multiplier on Wilds, then this increases to 18x for all your Free Spins. The two key features you can use prior to betting are the Doubleplay feature and the Superbet feature. The Doubleplay feature allows you to increase the size of the multiplier attached to any Wild win. This is set at a default value of x3, but you can increase that to either x6 or x9 for either 2x or 3x your standard bet size. The Superbet option increases the number of enhanced reels in the game but for a premium. For your 25 coin bet you get Enhanced Wilds on the third reel, for 50 coins you get them on the middle three reels and for 100 coins you get them across all reels. In my humble opinion, while adding these extra features makes the slot more exciting, it does come at such a huge increase to your standard wager that it is very hard to make money playing the slot. If you enjoy slots that give you a massive choice of different features to unlock as well as options for different features to be active if you want them to be, then Double Play Superbet from NextGen Gaming will tick all the right boxes. By activating different bonuses and options, you can increase the chances of a bigger value win or greater multipliers, at an increased cost per spin. Is the trade off worth it? Like all good slots, sometimes it is sometimes it isn’t, but there’s no denying that all the various options combined with a decent Free Spins game makes Double Play Superbet well worth a closer look.